Ensconce yourself in extravagance with our Colombina Barocco - Gold - Venetian Masquerade Masks. The Barocco style mask is reminiscent of the festivals of old Italy. Our Venetian masks are handmade in Venice, and are create utilizing the same techniques of long ago. 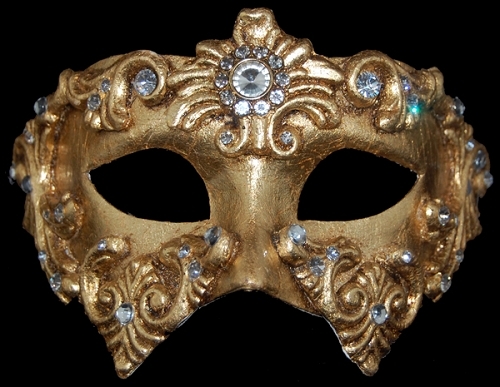 Our Barocco masquerade masks start with a paper mache eye mask, and are then painted in striking gold. Added around the outer edges of the mask and at the forehead, are large regal looking artistic additions brushed with dark translucent gel to give an aged look. Accenting the additions are faux diamonds and pearls to complete the lavish look. 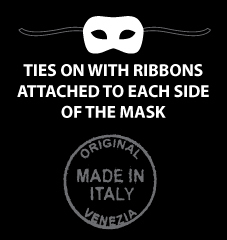 Our Venetian masks tie on with black ribbons and make an amazing focal point for your next masquerade event. 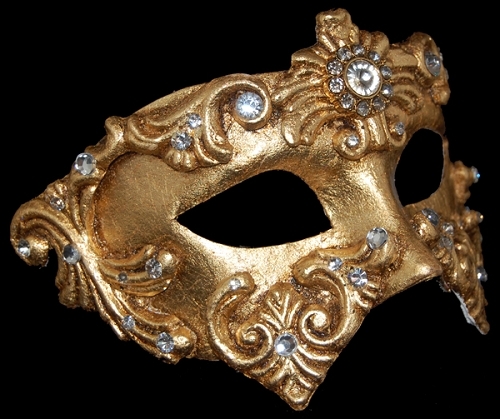 Add a plush black, red, or gold hooded cloak made by Venetian Mask Society to complete your masquerade costume.